This is an epicurious recipe , which I tried recently and my family LOVED this..! 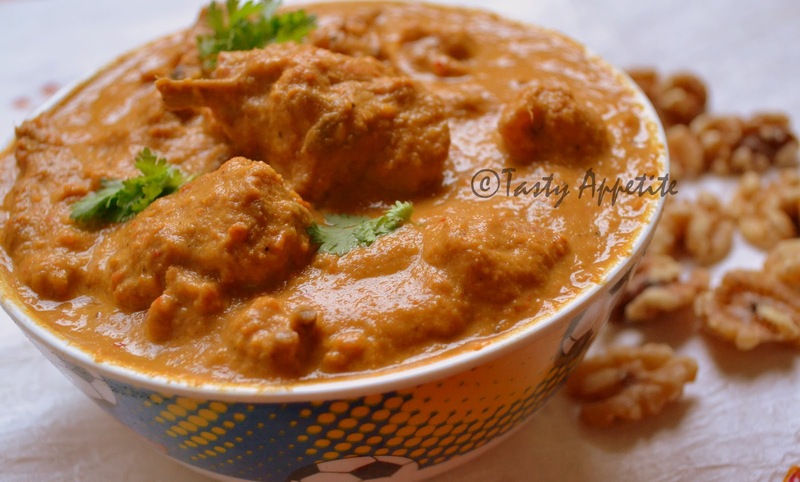 In this rich curry, the chicken is cooked with spices & powdered Walnut. 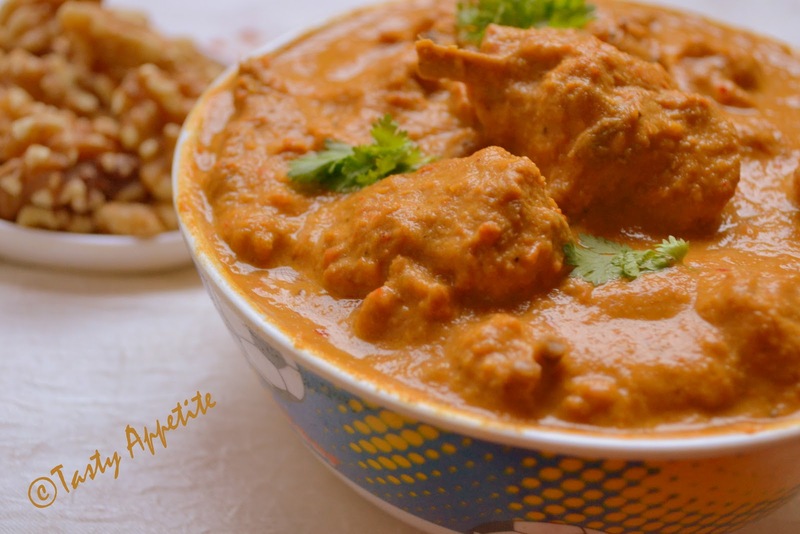 The recipe is uncomplicated and easy to follow & produces a tasty curry full of creamy texture and flavor. We know walnuts are rich source of energy and contain many health benefiting nutrients, minerals, antioxidants and vitamins that are essential for optimum health. Lets pop some Walnuts daily in our menu, for a healthy heart , to loose weight and to sleep well. Here's an easy recipe to prepare best Walnut Chicken...! 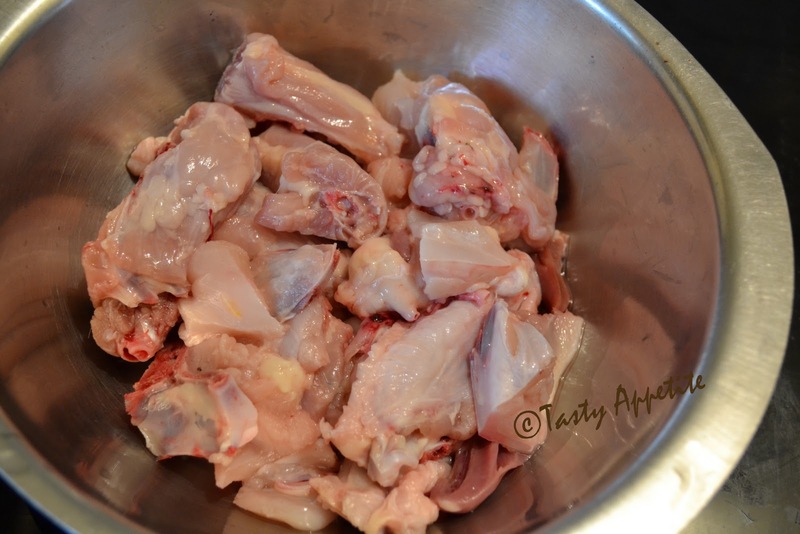 Wash and chop chicken pieces to small pieces. 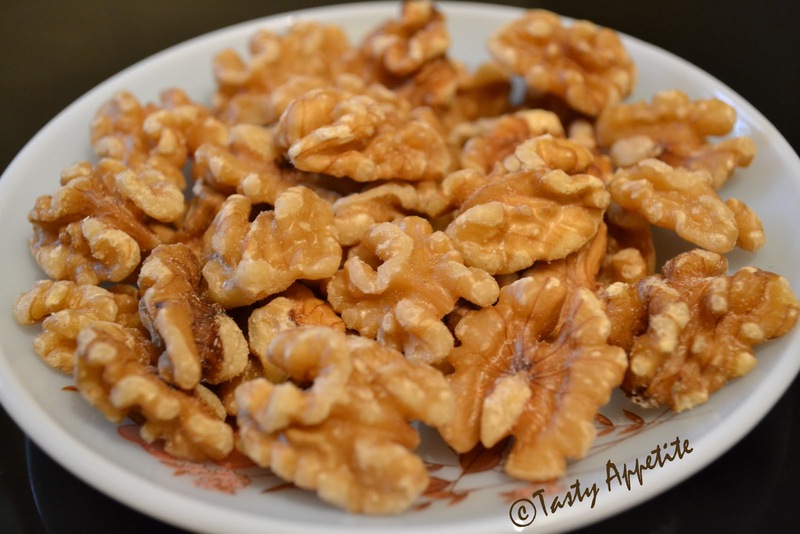 Dry roast walnuts for a minute, cool and grind it to fine powder in a blender. Add tomato puree and sauté till oil separates. Add pepper pwd, coriander pwd, cumin pwd, crushed red chilly and combine. Add marinated chicken, mix everything. Add 1 cup of water, cover and cook the chicken in this gravy, till tender. 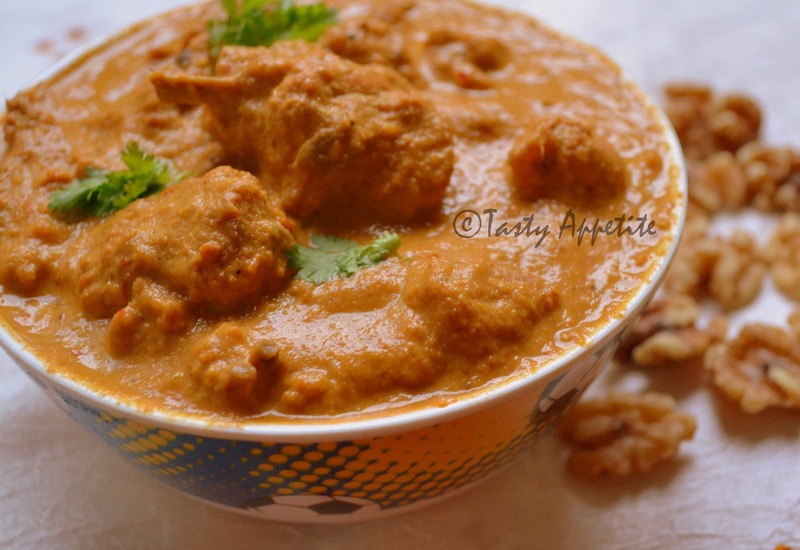 Once the chicken is cooked completely, add powdered walnuts and curry masala pwd. Mix well and bring it to boil for 3 to 5 minutes. If the gravy is too thick, add little water as required. Add fresh cream and cook further for a minute in simmer. Lipsmacking and healthy Walnut chicken curry ready to taste. Serve hot with Naan , Roti, Rice or Bread or anything of your choice. walnut chicken.. that looks spicy. i like that. I love walnuts in my banana bread, but never tried them with chicken. The combo is interesting and the clicks look delicious. Will try this one.! This looks gorgeous - I love curries with nutty sauces. Mi fa veramente gola , mi piace la cremosità e le noci sono buone davvero . Jay that looks very appetising dear! Lovely curry! I've always added almonds to my cooking...never thought of walnuts! Thx for sharing! I've never tried chicken with walnut..Gr8 recipe...Looks soo creamy & rich...yum !! Your curry chicken looks so good. Taking curry with walnut sounds great to me too. Hi Jay, I really fall in love with your walnut chicken. It looks excellent and delicious. Hi Jay,your chicken sounds so full of flavor..Have a great week! Oh,that's more than tempting.Rich gravy and nice chicken..Real flavourful! Looks delicious, yummy and spicy. wow! !looks so tasty & mouthwatering!! Sounds yummy...looks so tempting and delicious. Thanks so much for your comment on my blog post, especially because it led me here to your blog!! I LOVE the look and sound of this recipe. I am bookmarking it right now to make for my husband! This looks so delicious ! I really love your blog, come visit mine if you have time, and let me know if you would like to follow each other ! have to try this one I usually use coconut. Very nice and sure our kind of food, simply delish with white rice. Sooooo creamy and delicious chicken.. This looks delicious! Love your blog by the way, thanks for stopping by mine! It's great to hear about the nutritional benefits of walnuts too. Great post! I love curry and yours looks fantastic! Walnut chicken looks creamy and delicious. Oh, that dish looks and sounds so good! I'm drooling. 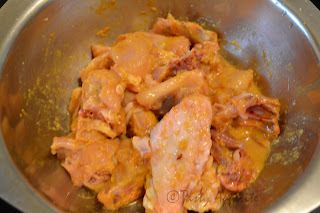 Yumm Chicken recipe Jay.Hope it tasted deliciously good as it luks super inviting in the clicks.Luv it Jay!. Love this recipe and LOVE epicurious! Awesome. Definitely a super rich chicken dish. walnut chicken...wow...that looks yummy n delicious ! I prepare Almond chicken but tried with walnut. Looks good..Will give it a try !!! Yummyyyyyand tasty Jay. Love it absolutely. A super rich and tasty chicken dish. I love walnuts! Oh, wow...I think if I made the walnuts into a powder, my picky hubby would not even realize he was eating nuts! Wonderful recipe, Jay! amazing pics so delicius!! hungryyyyy!!! Passes to see me on my blog and if you like we can follow each other? That looks quite yum! thanks for stopping at my blog! I wish I could eat all that rigiht now (I have candida) but it is some great inspiration! I have to give a go to your version. Last year I made chicken with walnuts and pomegranite...Delicious! Yum, it reminds me of butter chicken but I love that it has ground walnuts in it. This looks like the Mexican mole which uses almonds, love the combination of nuts and chicken. I have had a great time perusing many of your posts! A very nice blog you have here with delicious looking recipes and very clear photos of preparation! So nice stopping by to visit with you!